UDM Downloads > PlanetRemote Standard! PlanetRemote is a complete software package that allows you to take control of your computer and access your files remotely as if you were actually sitting right in front of it! You can control your computer from any computer connected to the Internet or your local network (LAN) using a standard web browser or using the included PlanetRemote Viewer. You can access your files using your web browser using the familiar Explorer-style navigation interface. Easily upload and download files or switch the displayed file listings to List, Icons, Details, and Filmstrip. PlanetRemote includes many advanced security features and will log all incoming remote control connection requests. Access to your computer is restricted by means of a special password and can be further enhanced by enabling a host access control list. This access control list allows you to restrict access to your computer based on the connecting computer's IP or network address. Computers with excessive password failures can be automatically added to your block list. 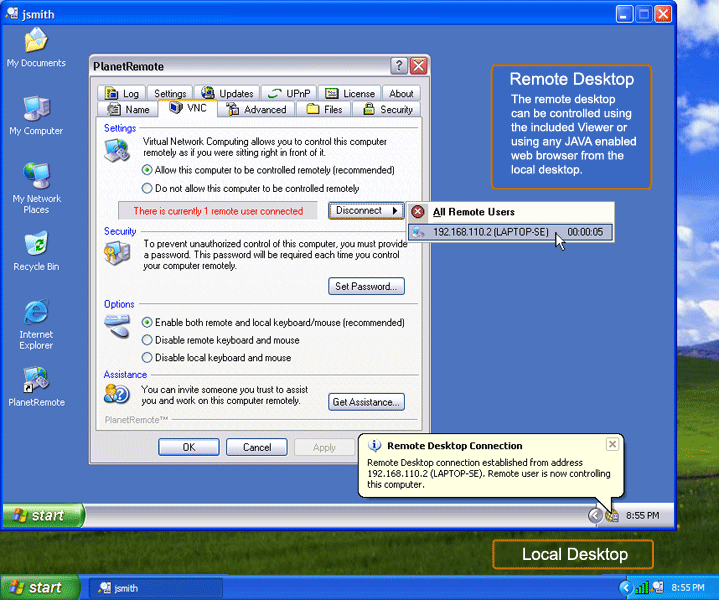 PlanetRemote Viewer can be used to quickly list all of the available computers on your network that have the PlanetRemote software installed and can even remote start a computer that has been turned off (Wake-on-LAN).